We are going to be able to rebalance if, it is necessary the rate of energy from your body by refocusing the will and in repairing these tears. We will balance the chakras and recirculate the energy of the various bodies to ensure that everything is in harmony. For this I used the magnetism, and the lithotherapie ( care by minerals). The principle is simple, i am circulates the energy through my hands. I am an antenna that picks up the energy and you the passes through the doors of energy (chakras). The lithotherapie rests on the same principles. The minerals are responsible for a certain energy which placed on some parts of your body, you pass. Each stone and is made up of minerals and oligos-items which will also penetrate in you and help you through the same. During the meeting stands to cabinet (under appointment) i will you rebalance. You tighten or sitting in an upright position so that i refocused your will and balance your chakras. 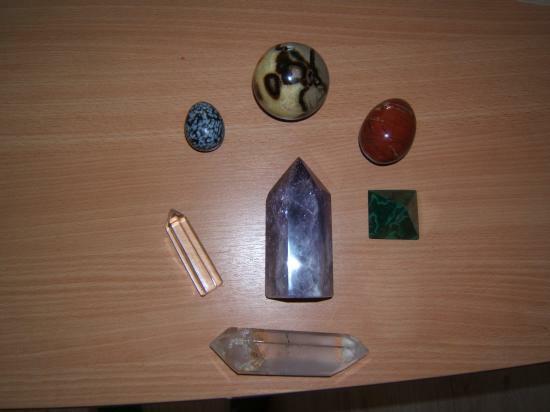 Then you will be in the prone position and I will dispose of the stones on your body to some places for a variable period (it depends on the problem) between 5 minutes and 30 minutes, you can relax during this time, let the energy of the minerals act. The rebalancing can be done by email or post in me stating your name, surname, date of birth and a mandatory photo (I do not practice it that for the consenting individuals ). The principle will be exactly the same as that of the cabinet I will use your photo as a link, except that for the lithotherapie i'll use a different principle but just as effective.